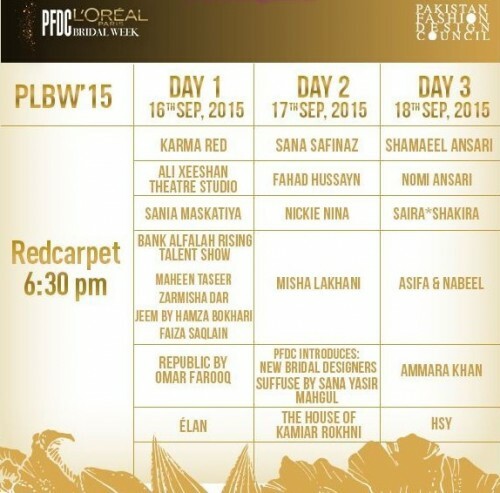 From 16th to 18th September, 2015 PFDC Oreal Paris Fashion Week 2015 is going to be carrying out. As well the names of the fashion designers who are going to be exhibiting their work, dresses and fashionable products are as well declared. Latest designs, newest fashion and latest fashion statements are going to be showed up in PFDC L’Oreal Paris Fashion Week 2015. The designers who are going to be showing up their bridal collection 2015 such as Ali Xeeeshan, Nomi Ansari, HSY, Ammara Khan, Misha Lakhani, Saniya Maskatiya, Sana Sarfaraz, Republic by Omar Farooq, Saira Shakira, The House of Kamiar Rokni, Karma red, Nickie Nina, Shameel Ansari, Asifa and Nabil, Elan. Newcomer designers are going to be introduced who are going to bring fashionable and newest fashion for us.